Learn the Excision of median nerve tumour and Axogen AxoGuard nerve protector wrapping surgical technique with step by step instructions on OrthOracle. Our e-learning platform contains high resolution images and a certified CME of the Excision of median nerve tumour and Axogen AxoGuard nerve protector wrapping surgical procedure. Peripheral nerve sheath tumours are rare but the true incidence is unknown as many are asymptomatic and present as spurious findings on imaging for other pathologies. When they are large or occur at natural compression points they are more likely to be symptomatic. Small subcutaneous nerve sheath tumours may present as small lumps that are painful if touched. Most tumours fall into the benign category and are either Schwannoma or Neurofibroma subtypes. Most are solitary but both can present as multiple tumours in neurofibromatosis. Multiple Schwannomas are also a feature of a separate genetic condition Schwannomatosis in which strings of multiple tumours may arise from a single nerve trunk. 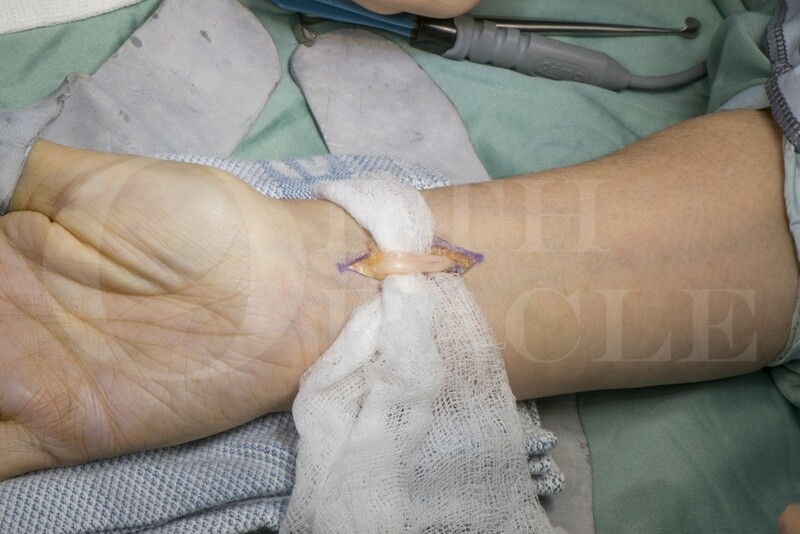 Following excision superficial nerves may remain sensitive or tether in scar tissue. The AxoGuard nerve protector (Axogen) is made from layered porcine extracellular matrix and provides protection from scar formation and adherence to surrounding tissues. Rapid revascularisation allows soft tissue incorporation and restores nerve gliding.